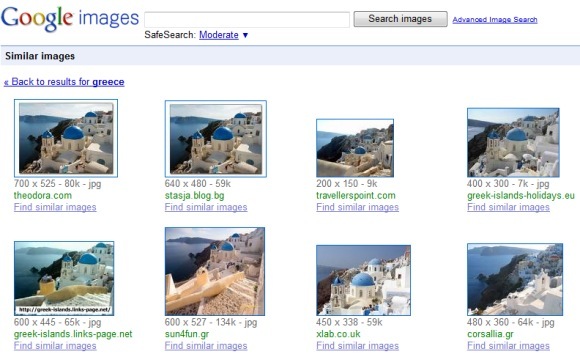 Similar images, the feature launched in Google Labs half a year ago, is now included in Google Image Search. It's a quick way to refine the results by selecting one of the results and finding similar images. You'll find different versions of the same image, images from the same location or images that closely resemble the initial result. Google doesn't find more than 1000 similar images and only the top results are usually relevant. A help center page lists two use cases for this feature: finding results for ambiguous queries like [jaguar] and refining broad queries. 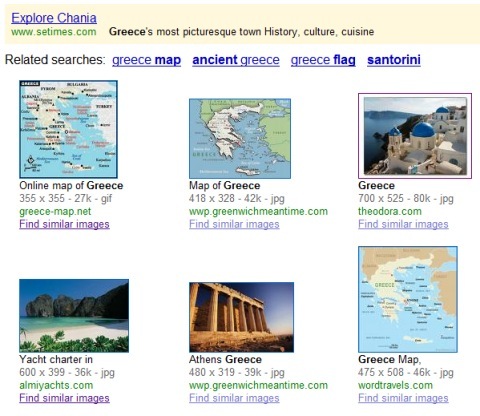 If you search for [Greece], it's not clear if you want to see a map or photos from Greece. Bing has a similar feature, but the results are less consistent. I like the changes they made with images. It's so much smoother, at least on my poor computer.